Here comes the bride!!! 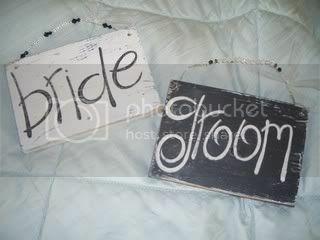 To make your day PERFECT with all the right touches...here are two sweet signs for your dressing rooms...announcing "Bride" & "Groom." These are our "original" design & one of a kind...so be creative! Each sign is about 7 1/4" x 5"...painted white & black of course...then lightly distressed for that vintage, old world we all love! We have added a beaded hanger to each...a little piece of tulle...and GLITTER for that added sparkle! All of our sign are made from salvaged wood & handpainted...making each sign a "one of a kind." If you have any questions...or requests...please let us know!! Perfect for "getting ready" rooms, or maybe slung on the back of your reception chairs? Good price, too -- and I love the script. Great find! I just bought them. :) They're too cute and totally fit with my more casual theme. Thanks for posting these!